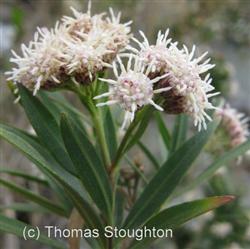 Baccharis salicifolia is a species of flowering shrub known by the common names Mulefat and Seep Willow. It is commonly found growing along stream beds, ditches and other watercourses. It flowers abundantly with small white blooms with separate flower heads for male and female blossoms. This shrub can grow up to 10-12 ft high and 6-9ft wide and look a little weedy and unkempt in the wild but with some extra care (it responds well to cutting back) and plentiful water can be groomed to stay green and full. It is worth the extra care and water if you love to attract pollinators as many different pollinator species love this plant.